Born Oneida County, Wisconsin, July 23, 1963; married; 2 children. Graduate Rhinelander High School, 1981. 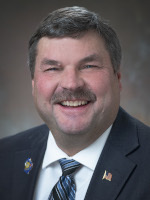 Tavern League of Wisconsin (former president, zone vice president, district director); American Beverage Licensees (former member, board of directors); Oneida County Tavern League (former president, vice president); Rhinelander Chamber of Commerce; Oneida County Republican Party.